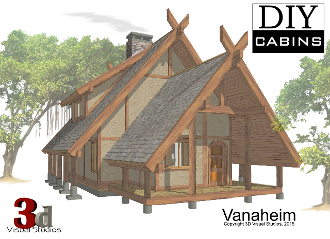 Vanaheim is a 1,708 sq ft residence with three stories, thus making the overall footprint relatively small. This cabin has become our personal favorite. We drew on Norse and Viking architecture when creating this design, then incorporated modern ammenities and codes to make it modern. Because of its small overall footprint, this house could fit on vitryually any property. The plan incorporates the use of large timber accents to give it the viking feel.